If you eat breakfast and lunch and snack before you go to a holiday dinner.. you will eat less (don’t save your calories). Find lean protein and green veggies and you will always be safe. Drink clear distilled alcohol: vodka, clear rum, tequila, sake, rather than wine.. you will not gain weight. Use low-fat dressing, not fat free (loaded with salt, sugar and chemicals). Eat complex starch (avoid all white starches) in small portion: sweet potato, brown rice, wild rice, quinoa, etc. 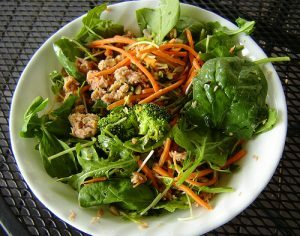 Follow the 70/30 guideline; 70 percent of your meal should be lean, and green, then 30% should be everything else. When travelling bring your own healthy snacks, so you are not tempted by random foods that will not help you. Carry a protein bar with you, if you are not sure what foods will be served, ie: Thin Thin bar 20gms Protein, 220 Cal, or a Clif Builders bar, 20 gms of protein, 270 calories, or a South Beach Fit bar, 140 cal, 8 gms of protein, or a Zone Perfect bar, 210 cal or 190 cal, 10 gms of protein. Contact NYC Nutritionist, Carly Feigan at 212-706-4298 for your free 15 minute consultation.